Hi Chiaki, thank you for taking a break from teaching your Artful Aging™ programs to chat with COMPAS. Can you tell us about your art form? SAORI weaving style focuses on self-expression rather than perfection. SAORI originates from Japan where I am from and was founded by Misao Jo who is 104 years old now and used to weave Kimono sashes. One day she made a mistake on her sash and someone said, "You made a mistake.” Her response was "that's why this is beautiful.” That's how SAORI was founded. So, SAORI doesn't have mistakes. We call them "happy accidents" or "meant to happen/be there.” We learn together as a group, explore, think about differences between machines and people and weave with a happy heart! 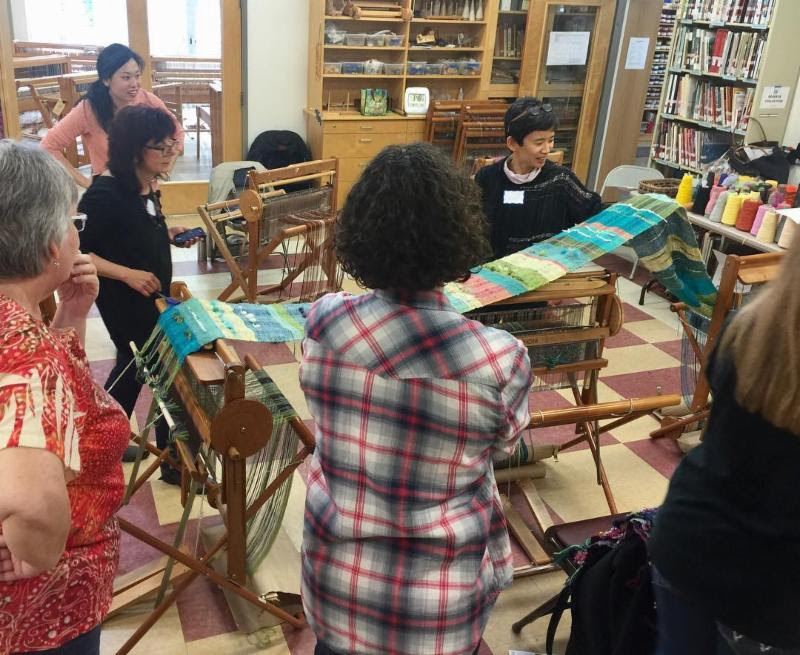 Do you remember when you first became interested in weaving and visual arts? How did it happen? Did you have any big influences? I don't have any art background and I was not interested in art when I was younger. SAORI changed my LIFE! I was introduced to SAORI in 1996, I was looking for something new to learn during my free time. I didn’t know SAORI was a weaving style and one day I visited one of the studios in Japan. I almost left right away when I found out that it was a weaving studio because I thought it was like “home-ec” which I didn't like at all when I was in school. I signed up a three month trial class after I met a person who was doing a show there. They told me and moved me, "you can create something you would never be able to find anywhere in the world." I got hooked right away on day one. It is so freeing and great to express myself with colors and textures. It was totally different from the school systems where we had to copy/follow textbooks and listen to what teachers tell you. If you set your mind to it, it doesn't matter if you have an art background or not. Can you tell us more about SAORI weaving and how it differs from standard North American weaving? SAORI is a self-expression focus weaving style. The one big difference is that we don't need to worry about making straight salvages and follow patterns. If your salvages are not straight, that's your tendency. One of my salvages is tighter than the other. That's my tendency. SAORI is to find your tendencies. It is such a forgiving job for me that I don't need to tell people, "don't do this" and "do that," etc... I only have to say, "don't break looms" and I usually get laughs at the beginning of the class. I can just let them be while they weave which is beautiful to watch. You mainly work in COMPAS’ Artful Aging™ programs. What do you enjoy about working with older adults? How does it differ from working with younger students? I think about my parents and especially my father who is in a nursing home in Japan. I hope that he has something fun to do like using his hands and working with his friends. You don't need to count and don't need to worry about making mistakes while you weave. I pay more attention to if they are socializing or not. Sometimes, I meet participants who used to weave but because of the space, they don’t own a loom anymore. They are happy to get back to weaving. That makes me happy. There are many people who have never done weaving before, so that makes me happy to introduce weaving. Many of them create something for their children and grandchildren. It makes them feel proud to share something they created with their family! There aren't many differences between older adults and younger students. They like the feel of their work and being proud of what they created. If I had to name one difference, I would say older adults are more careful than younger students while they weave. What are your goals for your programs? What do you hope participants get out of it? I sometimes hear from younger students, "it is okay to be unique" and it's true for everyone. We are all different, so we admire each other and learn from each other. I hope for people to be proud of what they created and feel the JOY while they weave. What do you get out of teaching versus creating your own work? Do you have a preference? I learn about people. To be honest, sometimes I have someone in the class who is hard to work with but that's the learning experience. It is my own hands-on workshop, how to deal with those people. I like both teaching and creating. It's not new but I am back to spinning for my future weaving project. You have been on the COMPAS roster for about three years now. What’s it like for you to be a part of COMPAS? Being on the COMPAS roster was my dream for a long time. COMPAS takes me to a variety of places to meet a wide variety of people. I am so fortunate to share what I like to those people and learn about myself. When I'm cooking, even if I'm following a recipe, sometimes I add something that is not traditionally included. If it doesn't turn out the way I wanted, oh well, I learned that I will never use that ingredient again the next time I cook the same dish. Something new will be added to learn more!